As we celebrate the mothers in our lives this coming Sunday, I thought it timely to reflect on some of the remarkable women present in the historical galleries of Ngā Toi │Arts Te Papa. They are present as heroines and homemakers, as artists and as benefactors. They may not have been mothers, but they have nurtured and contributed to our country’s history, art and art history. Without them our stories would be much less rich and compelling. Who knew we had a historical heroine to rival those of Europe, the ‘Grace Darling of New Zealand’? At a time when Pakeha and Māori were in the midst of conflict over land, Hūria Mātenga became a national hero. 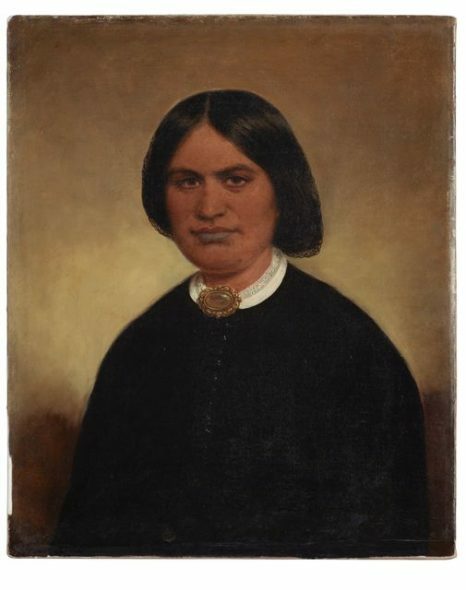 In September 1863, she played a role in rescuing the crew of the ship Delaware, driven onto rocks by a storm at Whakapuaka, just north of Nelson. Hūria, her husband, Hemi Matenga and three other men helped to bring the crew safely to land. 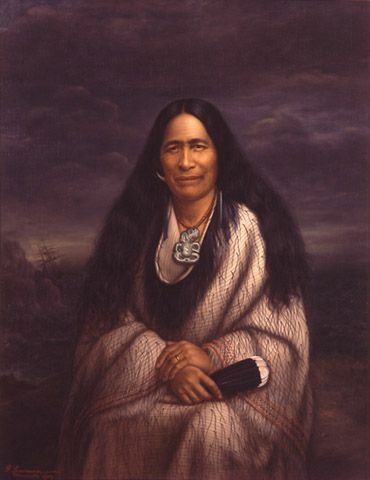 The grateful people of nearby Nelson commissioned this portrait after her death in 1909 from the well-known Māori portraitist, Gottfried Lindauer. This is an unprecedented example of a city honouring a female individual in such a manner, and suggests the great mana Hūria held in the community for over 40 years. Lindauer had painted Hūria shortly after his arrival in New Zealand in the 1870s, and another fine depiction is in the Partridge collection held at Auckland Art Gallery. Yet this painting, loaned from the Suter Art Gallery, Nelson, for the exhibition He iti whetu: Ngāti Toa Rangatira pictures Hūria adorned with the emblems of her aristocratic rank: a korowai (cloak), greenstone and shark-tooth pendants, and a kōtore huia – the prized tail feathers of the now-extinct huia. Installation view of He iti whetu: Ngati Toa Rangatira. Photographed by Norm Heke, November 2015. This is one of a pair of paintings of Ruta and her husband, probably commissioned by the couple from William Beetham, the first professional portraitist to settle in the Wellington region. In it, Ruta is depicted in European dress, a delicate lace collar and large brooch off-setting her sombre, black gown. Purchased 1999 with New Zealand Lottery Grants Board funds (1993-0003-1). 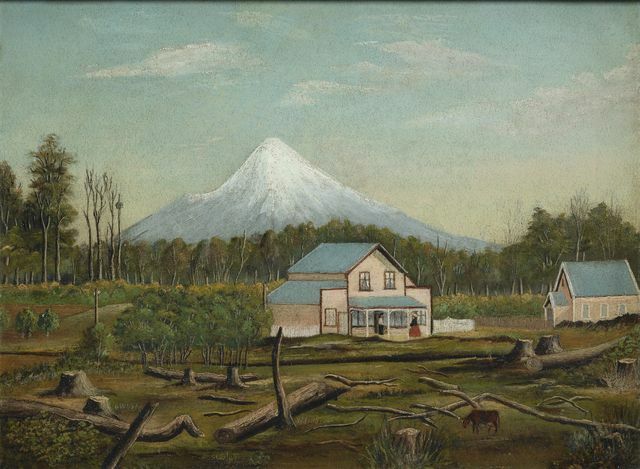 While Ruta and Tamihana were living a comfortable life, Landscape with settlers, a painting attributed to the Messenger sisters, pictures the attempts made by immigrant Pakeha to emulate the life to which they had been accustomed in the backblocks of Taranaki. Nonetheless, their naïve depiction of a house, somewhat uneasily placed in a recently cleared plot of land, offers a poignant reminder of the realities of colonial existence, particularly as the Taranaki region was so beset by conflict during this period. Sarah Featon’s struggles were of a different kind. She and her husband had co-produced The Art Album of New Zealand Flora in 1888, the first fully coloured art publication to be printed in New Zealand. Sarah’s vibrant pictures, reproduced by the relatively new process of chromolithography, complemented Edward’s descriptions and poetic writings about New Zealand flowers. James Allan Thomson, director of the Museum, recognised the value of Featon’s work and their potential as exhibits. 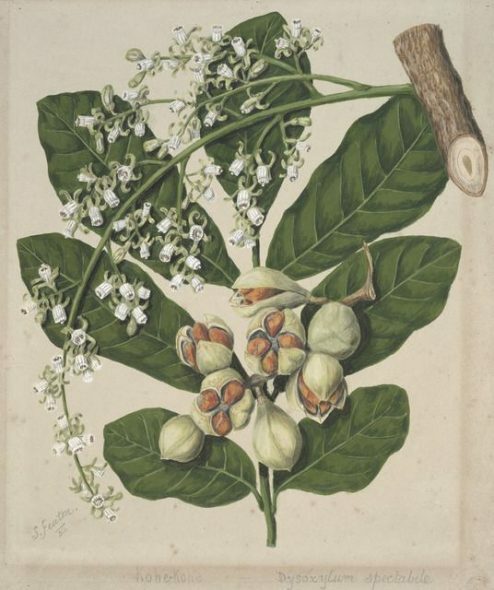 He did counter that ‘providing they are better than the reproductions in the Art Album of New Zealand Flora’ he would be ‘strongly in favour of their acquisition’. [iv] Luckily, they are. The chromolithographs may have been technically innovative for their time, but they strip Featon’s watercolour drawings of their subtlety and appear garish at times. On the other hand, the original watercolours are full of life, delicately handled where appropriate, and strongly rendered in others, bringing her visions of New Zealand’s flowers into the 21st century. Installation view of the exhibition Framing the View. Photographed by Norm Heke, January 2016. Lastly, I’d like to pay homage to Caroline Chevalier, a great benefactor of Te Papa’s art collection. 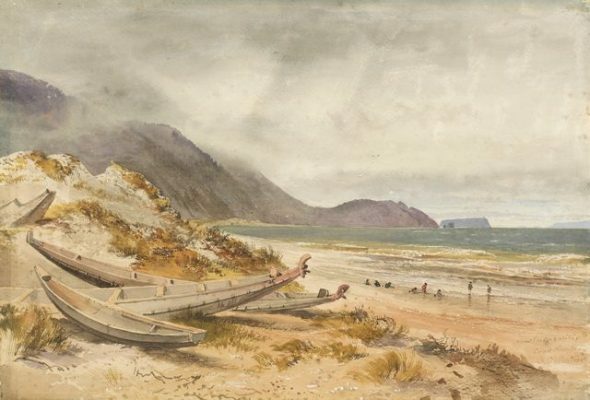 In the 1860s Caroline accompanied her husband, artist Nicholas Chevalier, as the first European woman to traverse the South Island from Christchurch to Hokitika. Their exploits are delightfully pictured in Chevalier’s sketches, and in Caroline’s account of the trip. It seems she never forgot New Zealand, for in the early twentieth century she presented many of his works to the New Zealand Government. 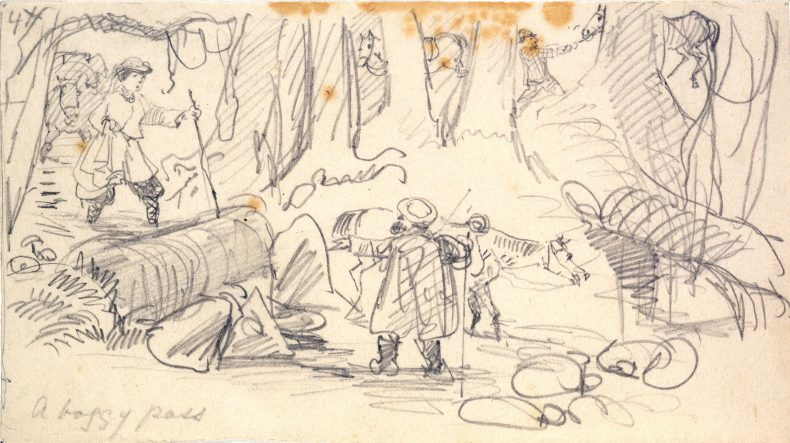 Te Papa has over 300 sketches in pencil and watercolour by Chevalier that chart his travels around New Zealand. Such a rich collection enables insights to be made into the artist’s practice. 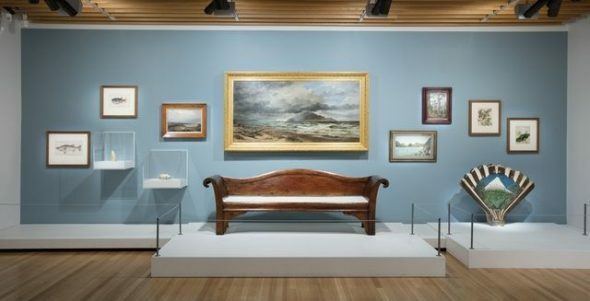 So when Te Papa purchased the magnificent oil painting Cook Strait in 2003, curators were able to locate his source material in the watercolour drawings gifted by Caroline. 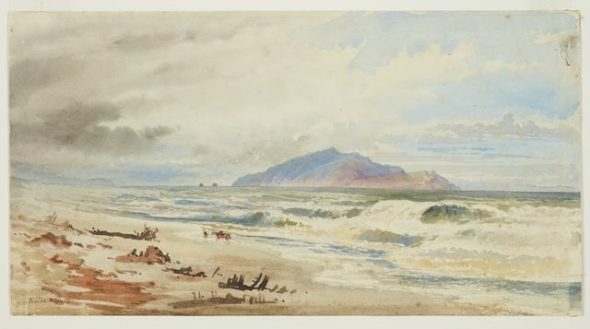 Notice how Chevalier has combined elements of the two sketches Kapiti and Near Paekakariki, Cook Strait to create a dramatic and romantic view of the Kapiti Coast. Without Caroline’s generous gift the curators and collection managers who carry out research into the collection would be unable to carry out such ‘art detective’ work. Thank you, then, to all these women, who have contributed to the histories, art and art histories of Aotearoa New Zealand. 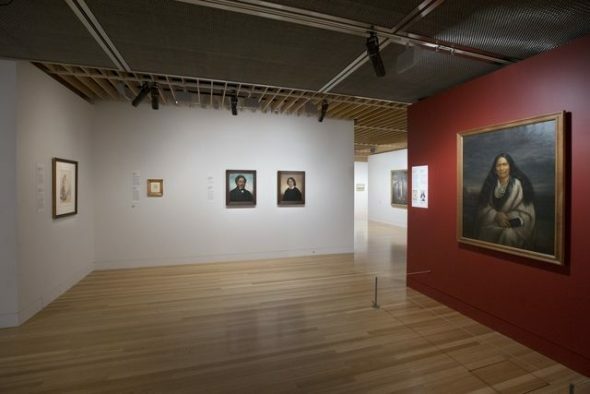 All these works are currently on view in Ngā Toi │Arts Te Papa. Perhaps you could treat the remarkable women in your lives to a visit this weekend! [i] Buick, T.L. An Old New Zealander. Whitcombe & Tombs Ltd, Wellington, p.329. [ii] Arthur H Messenger, ‘Coming of the Messenger Family to New Zealand; the life and story of William Bazire Messenger’, Hocken Collections, Uare Taoka o Hakena, University of Otago, MS-0562, p. 13. [iii] Sarah Featon to Mr Russell, MP (Gisborne) 20 September 1919. Te Papa Archives: MU1/5/15. There is a critical shortage of inaormftive articles like this. Thanks Kaylee! Nice to get your feedback. Great to see these lives and gifts celebrated. Thank you. Our pleasure, thank you Barbara. Thanks for your succinct, eloquent and celebratory article Rebecca. Just perfect for my research assignment – colonial Aotearoa and ethnologically-based storytelling related to concepts of partnership. A beautifully curated and educational piece of ‘art detective’ work. Thanks Rosa! I’m so glad you enjoyed it. Best, Rebecca.